One of the most crucial parts of a motorbike is the motorcycle tires. As the only part that provides solid contact to the ground, it plays a huge part on how the whole motorcycle functions and runs. Therefore, every good motorcycle bike should have good, appropriate tires. Each tire serves different purpose or usage. Basically the rear tire focuses more on the bikes acceleration power and carries most of the bikes weight, while the front tire is more focused on the braking power and provides controls on the desired direction. To ensure maximum bike performance and increased safety of the bikers, it is crucial to have the appropriate tire. Picking the wrong type of tire could have an impact on the way the motorcycle drives. It can cause motorcycle owners a fortune by replacing or repairing its tire constantly or worst can lead to accidents. When selecting the tires, it is important to remember certain criteria. The most basic thing to account in picking a tire would be the type of motorcycle you have and the type of riding you do. Tread style, tire bias, tire materials, size, speed and all other characteristics should all be designed for the needs of your motorbike. For instance, there are some tire tread patterns that are designed for different weather conditions, some can manage better grip on wet areas or there are some tire that are designed to withstand long distances. The point is, to choose mainly on the basis of your riding needs. An essential part of a tire is its rubber compound. Thus, it determines the life and handling characteristics of the tire. It would range from a softer to a harder compound. Soft compound tires sticks on the road and provides riders with good grip while the harder the compound the longer its life expectancy. For cruiser bikes which are ridden for long distances a harder compound is more appropriate. It would eventually extend the life of the tire. But if you are into sports bike then a softer compound is best since it provides extreme grip and good handling. A soft compound is stickier and is made for aggressive street riding. There are different types of tires for different types of motorcycles. There are tires designed for sports, touring, cruising and racing and to different weather conditions. What may be the bikes application, a corresponding tire is associated to it. 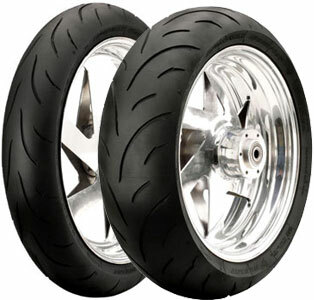 Sports motorcycle tires have tread patterns that are radial in style thus giving it a larger tire print. It is has a flatter appearance and its sidewalls are shorter. It is made to run hard on the road. For tires used in racing it is designed to withstand high speed under hours of use in the track. For Cruiser tires it uses bias-ply which is round and is made up of nylon and rayon cords. It is designed for superior grip but when too much heat is generated the tire decrease performance and breaks down rapidly. While for touring tires it has a harder type of rubber compound for long lasting durability. It is specifically designed for long mileages.